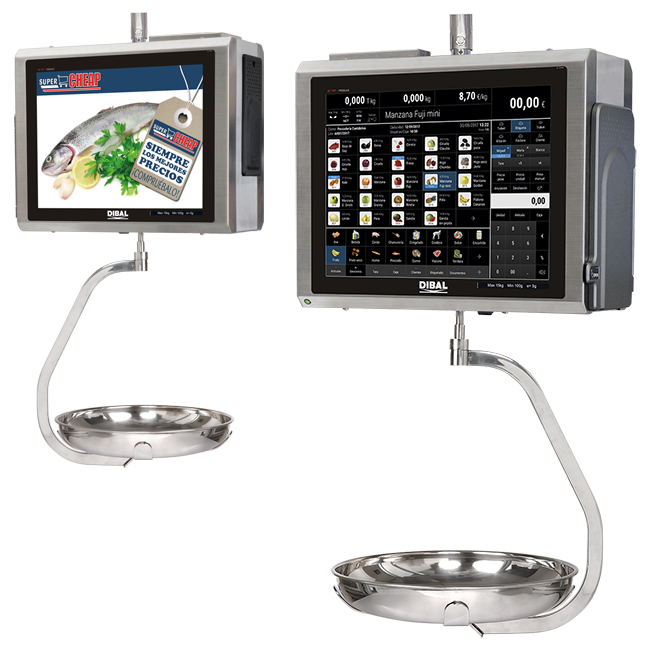 Hanging format PC scales, with touch screen on vendor side and colour TFT display on buyer side, receipt printer, label printer, or receipt+label printer and PC connection. A complete solution for your business with all the functionalities of a PC and a very intuitive use. Do you want to know more about Hanging scales CS-1100 Series? The Dibal CS-1100 Series PC hanging scales are a complete solution for your business as they have a powerful PC architecture, are extremely intuitive (thanks to the touch screen on the vendor’s side and the easy menus on Dibal sales and management software) and have a modern appearance (the display on buyer’s side, for example, is an attractive communication tool to show promotional images or videos). 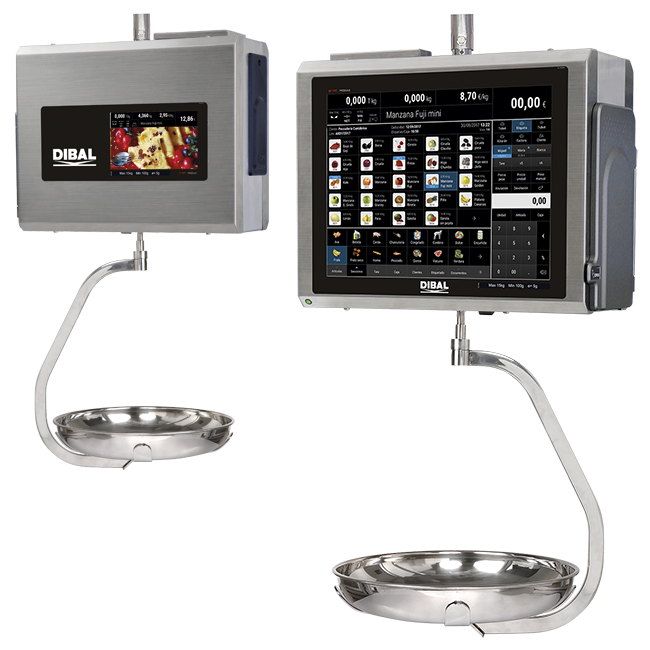 These retail scales can be connected to other Dibal scales or to a PC to send and receive data and updates. High performance retail PC based scale with double colour TFT. 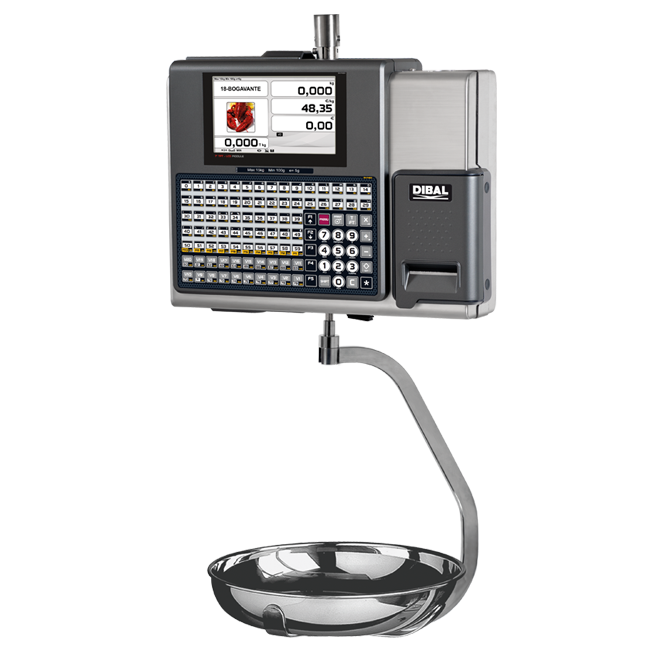 Models with label printer (suitable for receipts) or with 2 printers (for receipts and labels). Modern, compact and easy to clean design. Configurable and customizable vendor screen. More dynamic and stylish buyer screen as an advertising tool. High speed and resolution printer. Integration with Windows IT applications and ERP systems. User screen design application (for assisted and self-service sales). Each user may have access to his/her own sales templates, which may be associated with previously defined access permissions. 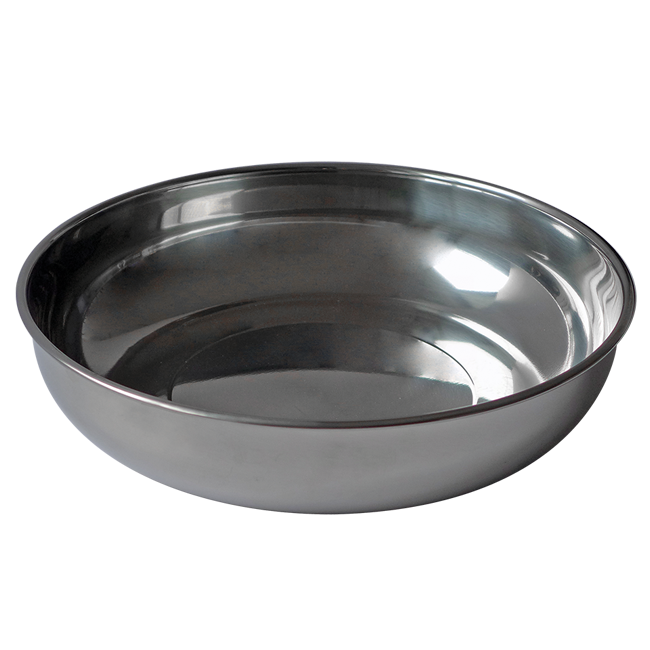 Wide range of templates for sales screens, articles database and food images (meat, fruits/vegetables, fish/shellfish, frozen food, drinks, etc.). Modern, simple and intuitive operating screens that facilitate the use and improve the experience of the seller. Cross-selling: showing the picture of a complementary product on buyer display when selling a product. Library of images and videos included in the scale for promotional support. Unlimited article keys (in consecutive screens). All the keys can include texts, icons, pictures, etc. Possibility of automatic ordering of the keys by different criteria: code, name, best sellers, etc. Configurable keyboard by PLUs, sections, vendors, QWERTY or ABC keyboard, etc. Quick access to itmes, sellers and sections. Quick change of the document to generate: delivery note, receipt or simplified invoice. Optional display of the receipt or label on the screen. Easy cancellation of receipt lines / easy reopening of receipt. Easy cancellation of simplified invoices lines. Printing of receipts and labels with Windows fonts. Invoices and delivery notes design. Pre-defined formats of labels, delivery notes and simplified invoices. Document format associated with client. Personalization of header and logos in simplified invoices. Issue of invoices and delivery notes. Generation of lists and graphs for total sales or broken down (by article, client, vendor, period, etc.) with three output options: on screen, via scale printer or via an external printer. Stocks, clients and providers management in the scale. Option to record normal price and offer price for each article. Price lists associated to each store or client. Stock and orders by article management. The SW-1100 application runs automatically at startup. 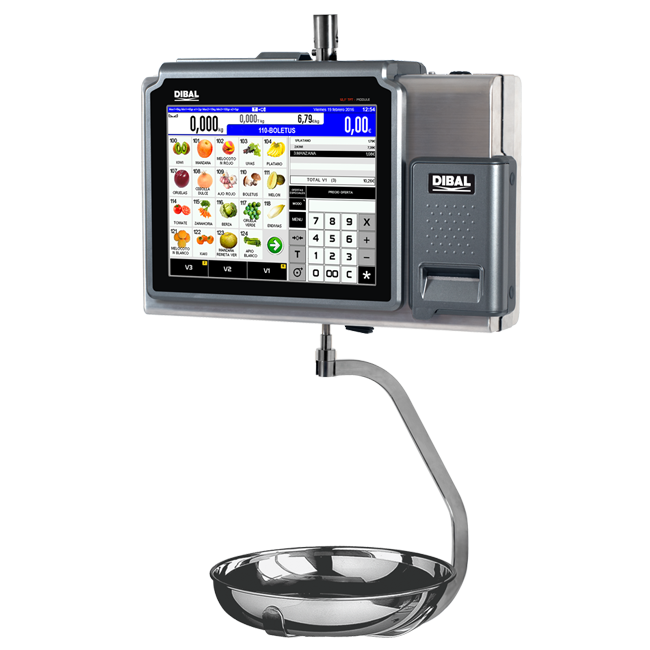 Also available with an open solution for the installation of any of the most popular POS terminal applications on the market. Multi-range (3,000 divisions): 6 kg / 2g - 15 kg / 5 g.
Mono-range (3,000 divisions): 15 kg / 5 g or 30 kg / 10 g.
Multi-range (3,000 divisions): 15 kg / 5 g - 30 kg / 10 g.
Mono-range (6,000 divisions): 12 kg / 2 g or 30 kg / 5 g.
Vendor: Configurable 15” resistive touch screen TFT (W304.13 x H228.1 mm). Optional: 15" projected capacitive touch screen (TFT). Buyer: 7” or 15” TFT. 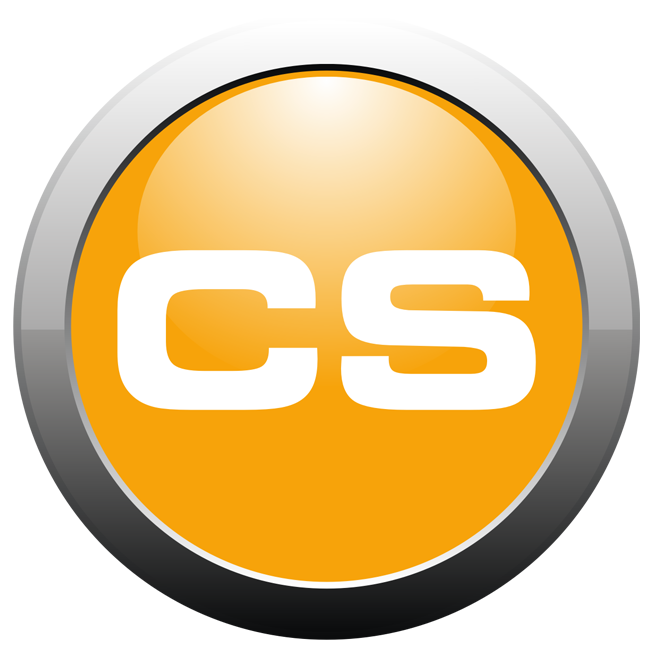 Allows showing advertising or promotional images even during the selling operation (more than 250 images and videos in the scale). 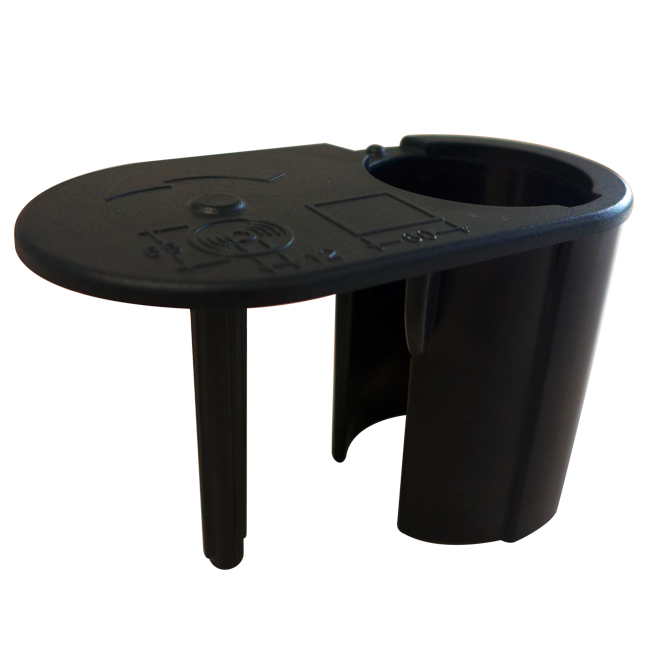 Models available with 1 printer for receipts or labels (changing the paper roll and the working mode) or with 2 printers (for receipts and labels). Resolution (8 dots/mm) and speed (100 mm/sec). Cassette for immediate paper roll change (in label printers). 3" thermal printer (77 mm) with autocutter for ticket printer. Extra external printer for invoices, lists, etc. Bar codes: EAN-13, EAN-128, CODE-128 and QR. Discounts per line and total. 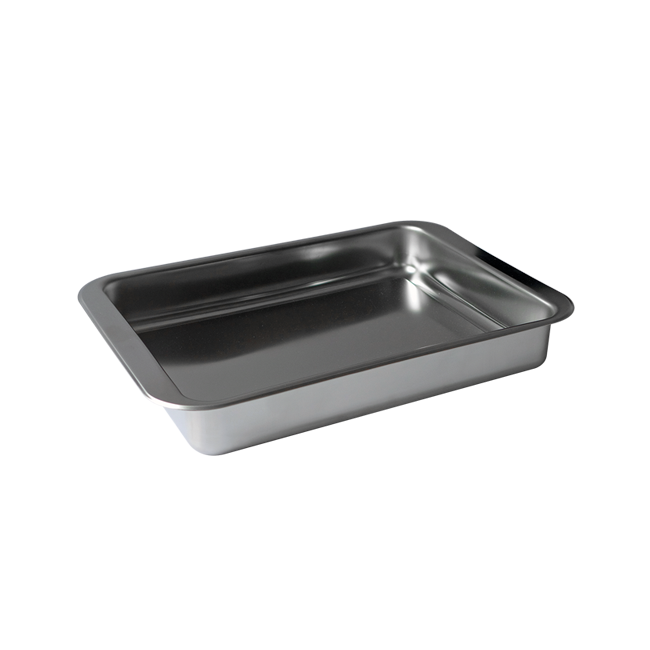 Offers: 3x2, 2nd unit discount, price per segment, free product, etc. From W30 x L30 mm to W60 x L190 mm. Packaging date, expiry date, freezing date and extra date (for any application). Unlimited types of generic traceability (for meat, fish, fruits, vegetables, etc.) and unlimited products. Included in the prevailing European legislation on bovine traceability. Effects: bold, underlined, or any effect of a Windows font for each character in the text. Possibility of using the general text “G” (21 x 64,000) for ingredients to highlight allergens with those effects and fonts. Programmable allergen table: automatically identifies allergens in the ingredient texts. For receipts, possibility of indicating in the PLU “name 2” of those that contain allergens “Consult allergens” (or PLU* + “*Contains allergens”). Possibility of printing 2 labels for each operation: programmable by PLU, configurable information, 2nd automatic or manual label (can also be used as promotional labels). Hard disk: 128 GB SSD. Optional: 8 GB (can be modified without notice). 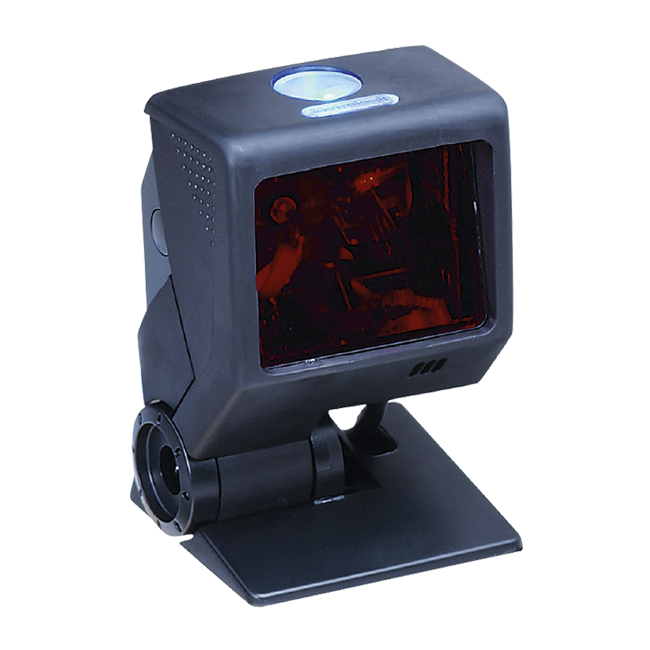 1 RS-232 (auto powered, for connection to bar code scanner). 1 Display Port (additional display). Receipt of sales data from Dibal 500 Range and D-900 Series scales. Bar code scanner (built-in scanner optional). Other peripherals: keyboard, mouse, etc. Point of sale secure cash payment system. 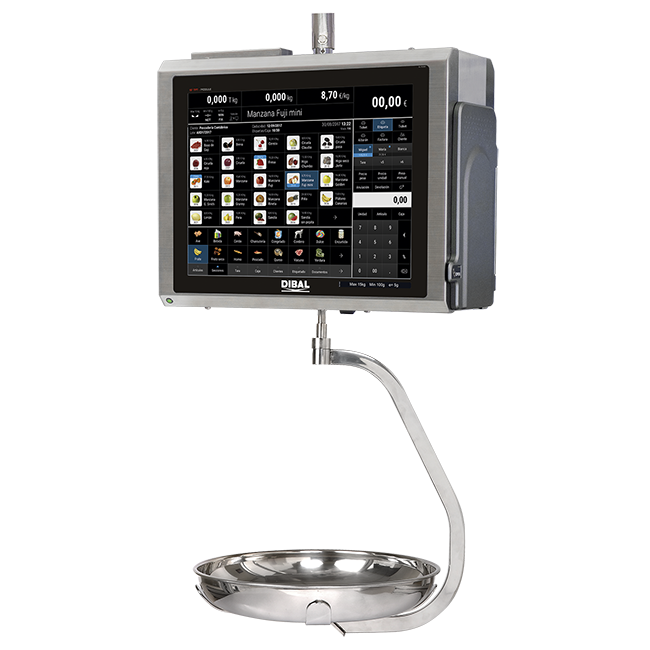 SW-1100: touch application for sales and weighing management. 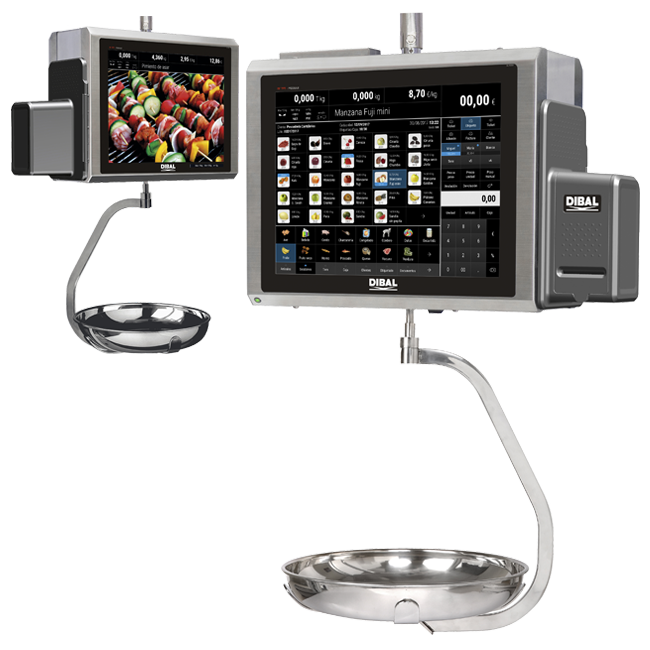 Vendor Display: 15” touch screen TFT. Operating system: Windows 7 (embedded). 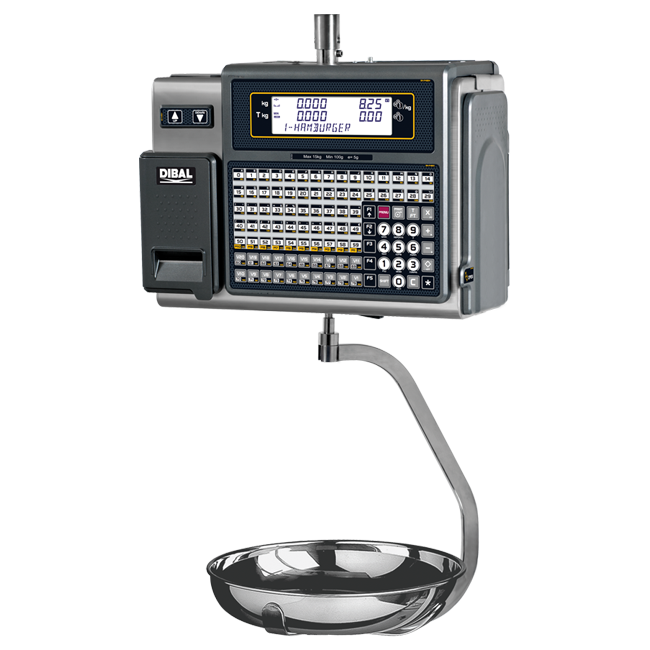 Sales software : Dibal SW-1100. Sales software : Not included (open solution). Printers: 1 Receipt printer + 1 Label printer. Label or receipt on continuous adhesive paper without supporting paper. 15" TFT touch screen for the seller´s screen. Not compatible with label printer. Memory upgrade from 4 GB to 8 GB. Touch application for sales and weighing management. According to EU weighing directives. (See section on equipment metrological verification). L360 x W280 mm, instead of the semi deep plate. Ø310 x H70 mm, instead of the semi deep plate. Includes connection cable to the scale. (For built-in scanner, consult the options). Emulator of Dibal PC scales software. Hanging format price computing scales, with receipt or label printer, or two printers (for receipts and labels), and PC connection. Easy to use retail electronic scales with excellent features. Hanging format price computing scales, with double 7” TFT, receipt/label printer, or double printer, and PC connection. 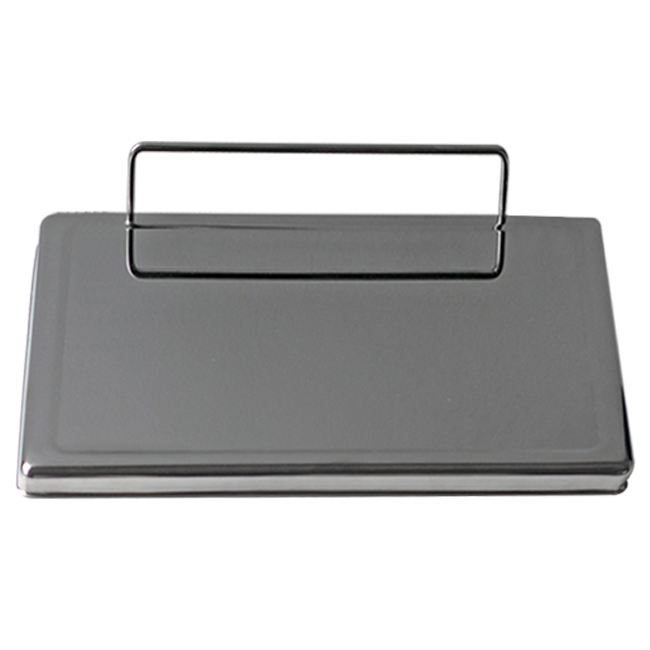 Easy to use retail electronic scales with excellent features. 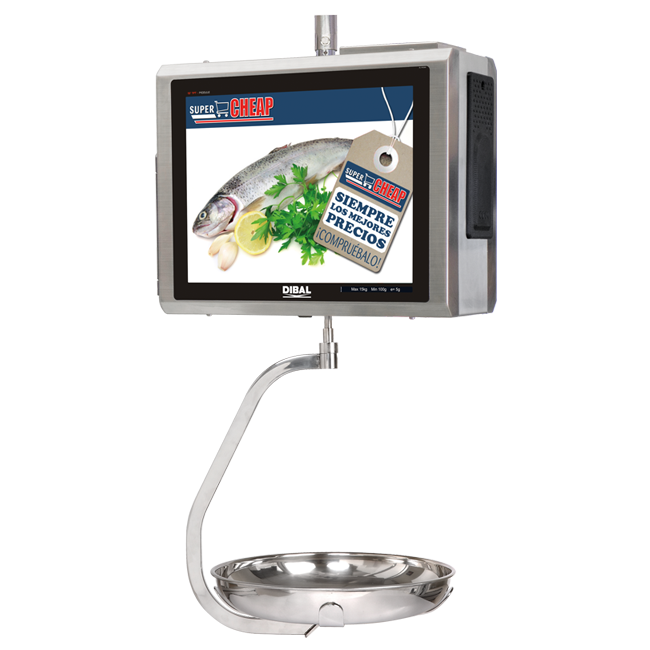 Hanging format price computing scales, with touch screen on vendor side and colour TFT display on buyer side, receipt/label printer or double printer, and PC connection. 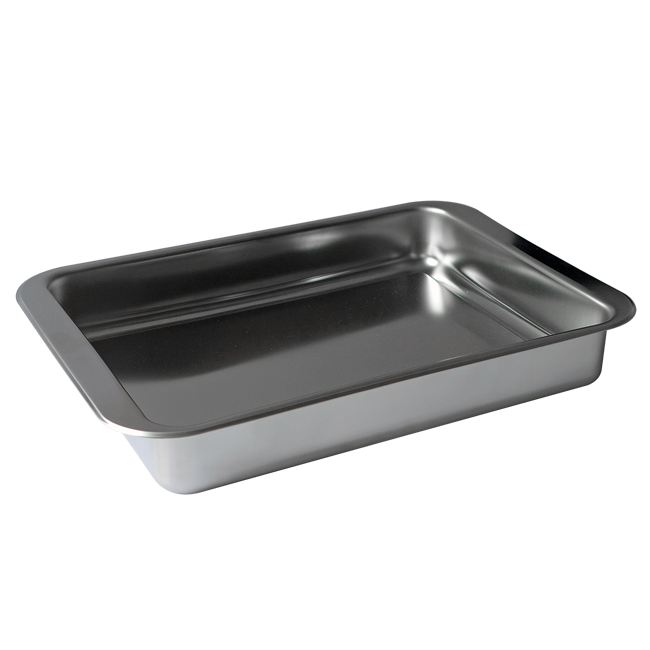 Easy retail scales with high performance. They are also an excellent communication tool for the seller with the client due to the colour display on the buyer’s side.